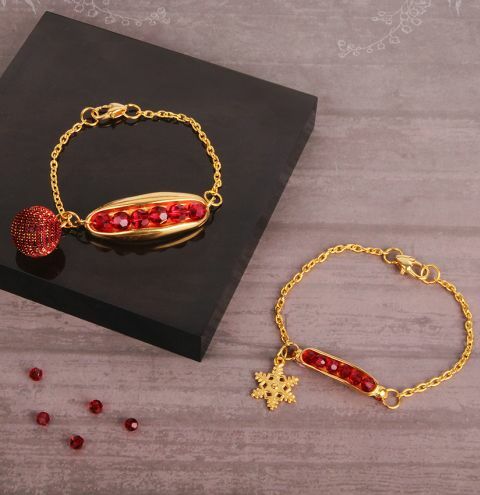 Make your Swarovski Scarlet Crystals them the centre of your design using the gondola connectors and charms for a beautiful Christmassy look! To make a 6.5in bracelet, cut two small pieces of chain (2 inch long) and attach them to either end of the gondola with a pair of jumprings. To fit the beads inside the gondola connector, thread your wire through and under the gondola to the back. Wrap it around the jumpring a few times. String on your beads and pass the wire back through the hole. Wrap it onto the other jumpring, trim the end and tuck it into the wrap. Attach your charm to a jumpring and then finish your bracelet by attaching your clasp on one side with a jumpring. Attach a jumpring to the opposite side.